What's one without the other? 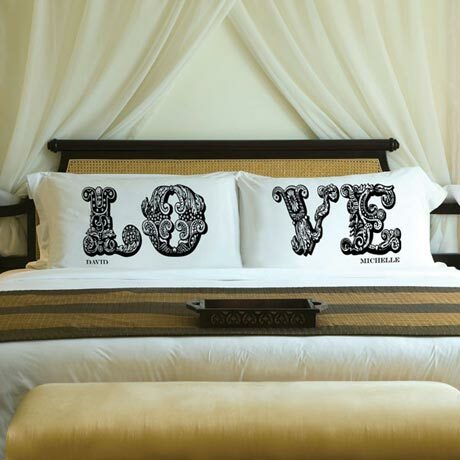 Just like a couple in love, these pretty, personalized pillow cases complete each other! Decorated with Victorian-style letters, our Personalized LOVE Connection pillowcases can complement any bedroom decor, from classic to modern. Printed on a soft white pillowcase, the LOVE letters on this bedding are accompanied by the first names of the recipients. Useful and unique! Each pillow case measures 22" x 30" and fits a standard or queen sized pillow. Made of a Luxurious Poly Sateen for a soft & long lasting slumber, the pillow cases are soft, high quality and machine washable. Select a color and personalize with "his" and "her" first names or with any other saying up to 15 characters on each pillow case. Allow 2-3 weeks for delivery. Item can only be shipped within the Continental US.